We believe that in order to help vulnerable children it is vital to empower mothers too, and each KCK centre has a Women’s Initiative project running alongside children’s activities. 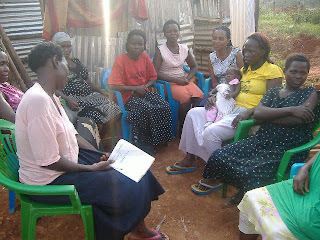 Women from each community come together to learn new skills, and to discuss sensitive issues such as HIV/AIDS and parenting. We run Adult Literacy classes for our women and various seminars and training days on different issues throughout the year. This not only provides education for the women but gives them a sense of empowerment and community. We also help these women to run income generating projects with the aim of contributing to lasting changes in the lives of these women, their children and entire communities. Friday 8thMarch 2013 is International Women’s Day. Every year, to celebrate International Women’s Day, Kids Club Kampala holds a big celebration for all of the women that we work with to celebrate them. Last year, we held a big celebration in Katanga slum and over 200 hundred women from our women’s initiatives at all different centres came together to celebrate being a woman. The day included talks and discussions on HIV/AIDS, health, business and entrepreneurship, nutrition and parenting. Food was provided for all the women and they enjoyed performances from Mukisa women’s group and KCK Katanga children’s choir. It was a fantastic day and the ladies all enjoyed themselves and learned a lot. Celebrations like this are vital to the empowerment of the women who attend our women’s initiatives, which is why we are planning to celebrate International Women’s Day again this year. This year, we asked the women who are part of our Women’s Initiatives what they would like to do for International Women’s Day, and the overwhelming response from the women was that they want to get HIV tested. We respect and care for all our women, so we want to honour their request by having this service available for the women at the celebration day. At Kids Club Kampala we also recognise the importance of providing a space to discuss issues and ask questions. The women also requested that during this special day for women there is space to discuss HIV/AIDS and sexual health issues, so we are also going to provide a space for this on the day. The day will also include food for all the women, performances from various women’s groups and KCK children’s choir, and lots of fun and celebrations. We and all the women are really looking forward to their special day. But, we need your help to make this day happen! We are looking for vital donations from friends and supporters to enable this day to go ahead. If you are interested in helping us put on this important day including HIV testing for all our women, please donate here. As little as £1 will go a long way to making a big difference in these women’s lives. Please contact us if you would like to know more. Older PostWhat an incredible month!